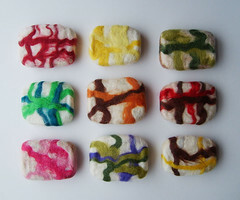 Felting Soap is a time-tested method of hiding really ugly soap or just adding value to a normal bar of soap. Wool shrinks when it gets wet. It’s a ten to fifteen minute process to felt a bar of soap but isn’t the final product beautiful? Check out The Funky Felter’s Etsy shop or her blog here. We have quite a few llama breeders here in the valley and I met one at a craft show. She gave me some wool and I tried felting. It is not as easy as they make it sound. These are wonderful, I love the colors.